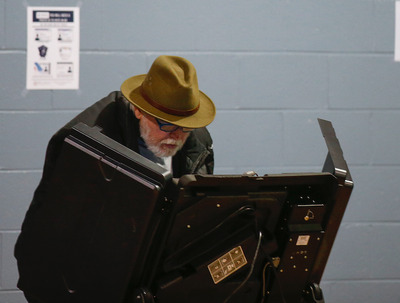 ReutersA voter casts his ballot at the Grove Presbyterian Church in Charlotte, North Carolina November 4, 2014. With all 435 members of the U.S. House of Representativesup for election on Tuesday, Republicans are expected to expand their majority amid dissatisfaction with PresidentBarack Obama, whose approval ratings have dipped to 38 per cent. Republicans, who currently control 233 out of 435 seats in the House, may pick up ten or more in Tuesday’s balloting — not enough to override a presidential veto, but good for bragging rights as the party accumulates what could be its biggest majority since the late 1940s. In a state where urban areas tend to skew blue, the eastern suburbs of Sacramento have long been a battleground between Democrats and Republicans, and the state’s dramatic redistricting process two years ago created a district that could go back and forth between the two parties for years. Democrat Ami Bera, a physician who eked out a win against the Republican who held the seat in 2012, faces an intense battle against Republican Doug Ose in what has become one of the most closely watched contests in the nation. As of Oct. 15, Bera had raised $US3.7 million during the campaign cycle that began in 2013, spending most of it to end the period with $US347,000 cash on hand. Ose raised $US1.6 million during the same period, and also reported loans of $US1.8 million, according to federal campaign finance records. In a race that has been targeted as a priority by both parties, San Diego Democrat Scott Peters is nose-to-nose with challenger Carl DeMaio, who is openly gay and calls himself a “new generation Republican.” Both candidates are former San Diego City Council members. After redistricting shifted a traditionally conservative district in Colorado so that it includes part of more liberal suburban Denver, Republican incumbent Mike Coffman found himself the target of a well-funded campaign by the Democratic former speaker of the Colorado House of Representatives, Andrew Romanoff. The race has been one of the most expensive in the country, with Coffman raising $US4.4 million during the 2013-2014 campaign cycle, and Romanoff raising $US4.7 million. In Republican-leaning north Florida, Democrats are hoping for a rare upset against Steve Southerland of the Republicans’ Tea Party wing who is serving his second term in the state’s 2nd congressional district. Challenger Gwen Graham seeks to unseat him by playing up the enduring appeal of her family name, campaigning alongside her famous father, long-time U.S. Senator Bob Graham. Graham has downplayed her Democratic label, painting herself as an independent voice for the “North Florida Way.” The race will test her party’s ability to reconnect with the traditional, white southern votes who have largely abandoned its national ticket. Republicans in south Florida are hoping to win back a seat they lost in 2012 in an all-Cuban-American tussle between incumbent Democrat Joe Garcia and his rival, Republican Carlos Curbelo. Garcia, 51, was the first Cuban-American Democrat elected to Congress in Florida, after a long line of Republicans. Curbelo, despite being only 34 and in his first congressional bid, is an experienced political hand, having run the campaigns of some senior south Florida Republicans. His hardline anti-Castro conservatism stands him well with older Cuban American voters. Democrats hope to pick up a seat in Iowa in the close contest between Republican David Young and DemocratStaci Appel, who are vying to replace Republican Tom Latham, who is retiring from a district that includes Des Moines, the largest city in the state. A recent poll showed Appel ahead, but when the margin of error was considered, the race was nearly a tie. In the northeast part of Massachusetts, four-tour Iraq War veteran Seth Moulton, a Democrat who ran a successful primary campaign against U.S. Representative John Tierney, faces Republican Richard Tisei, a former state lawmaker. The race upends some typical assumptions about U.S. politics, with the Democrat campaigning hard on veteran’s issues, while Republican Tisei, a gay man who is married, has positioned himself as socially liberal. In one of the more colourful races of the season, Republican Michael Grimm’s effort to hold on to his seat in New York’s 11th Congressional District after he was indicted for fraud, perjury and conspiracy in a tax fraud case has taken off in recent days. The once-tight contest against Democrat Domenic Recchia, Jr., a former City Council member, to represent the Staten Island district has opened up, with a wide 19-point lead for Grimm, according to the latest polling bySiena College with NY 1 News and Capital New York. “American Idol” runner-up Clay Aiken, a Democrat, may be headed for another second-place finish as he challenges U.S. Representative Renee Ellmers in North Carolina’s heavily Republican 2nd congressional district. Ellmers, who won the seat during the Republicans’ national electoral sweep in 2010, clinched her second term with 56 per cent of the vote in 2012. She led Aiken by eight points in a poll in late September. Aiken, who taught special education in North Carolina before his 2003 “American Idol” stint, argues the district is ready for a representative who will spend more time listening to constituents back home and be less consumed by partisan politics. Texas Democrat Pete Gallego is fighting Republican challenger Will Hurd, a former CIA operative who says his background gives him expertise in national security and public service. The two are fighting over a district that stretches for 500 miles from San Antonio to El Paso and is bigger than 29 states, according to Gallego’s Congressional website. The Mormon daughter of Haitian immigrants, former Saratoga Springs mayor Mia Love aims to become the first black Republican woman to be elected to the House of Representatives. Love is opposed to abortion and supports gun rights, and holds a concealed weapons permit. She faces Democratic attorney Doug Owens in a district created after the 2010 Census that encompasses parts of Democratic-leaning Salt Lake City, then runs south along the Wasatch Front into parts of rural Utah that are typically Republican strongholds. The most recent poll by UtahPolicy.com showed the race a virtual tie, with Love 48 per cent to Owens 43 per cent and a margin of error of +/-4.89 per cent.